Perfect for outdoor dining and gathering with friends, this Martinka 7-piece patio set by Corvus will turn your backyard into an outdoor oasis. The set includes one dining table, two loveseats, and four ottomans, crafted with durable, powder coated aluminum frames and hand-woven with grey resin wicker for a weather resistant and UV protected design. Comfortable cushions upholstered in machine washable, denim blue olefin fabric add comfort to the design, and the pieces of the set fit together to economize on space when not in use. My wife and I searched high and low for an outdoor dining set for our deck and I could not be more pleased with this set. I was most interested in the 'tuck away' style of patio dining furniture but this was the _only_ design that offered a 'love seat' style seating. Man, this is a really NICE set. My wife and I were apprehensive - the cost was definitely more than some of the similar styled sets, but honestly I'm pretty happy that I went with the one that I wanted. Serious bonus points that this set was already assembled. Compared to similar sets, this set is VERY sturdy. The larger love seats are one piece with no real visible seam so I am confident they will last quite a while. The smaller 'stool' seats are also one piece and very sturdy looking. The 'denim' cushions are actually fairly light blue and go very will with the light gray color of the set - another reason we were particularly interested in this set. A few things worth noting: The set arrived well packaged, in perfect condition and was pretty easy to pull apart and get situated on the deck. I did have to wait about 2 weeks for it to arrive (worth it). What I love about this is that I can literally stretch out lengthwise on the 'love seat' in a way I would not in any other 'dining' set. We actually keep the sofas on the corner of our deck without the table for casual 'chilling' but also have the option for a full-on large dining setup for eight people - pretty killer. When we are just using the couches, we actually make a small plexiglass table-top for two of the seats so that we have a casual 'ottoman/serving platform' for drinks etc. So, in sum, this is an entirely unique set that is really awesome, slightly more expensive than I'd normally want to pay but I'm thrilled that we got exactly what we wanted. I highly recommend this set. BTW, I know I'll get $** for this review, but I am personally skeptical of reviews. Trust me, I'm a pretty tough cookie on reviews but I genuinely love this set. Order arrived early and in great condition. The color and configuration is perfect. I’m thinking a great table for gaming! Unfortunately the quality of the cushions are very poor. Maybe two inches thick and the material is scratchy and don’t stay in place. The depth of the bench seats are about 2 inches short. So close but unfortunately short of comfortable. This is a beautiful set! Well made, cushions are not quite as powder blue, a little deeper blue. The grey wicker is darker also, but still is beautiful! Great price for this exquisite set! The coolest thing is it can all be stored into a cube like shape when you put all the pieces together for storage. I would definitely recommend this set. I also have the matching 9 piece set that goes with this. I love the color and it was exactly what the picture looked like. It stores perfect in one cube. There’s no room for the 4 pillows with the cushions once everything is pushed in for storage. They’re the only things you have to bring inside. Love this set! Its great how the seats and ottoman type chairs tuck away when not in use. We paired this with the Corvus Martinka 11 piece Outdoor set and couldn't be happier. The cushions are pretty good quality, and look like they should stand up pretty well to the elements. The wicker is also pretty good quality. I was a little hesitant to purchase online site unseen, but am very happy with this purchase. If I had one small gripe, it would be the set is a little shorter than I imagined, but the dimensions are pretty accurate as listed on Overstock's site. Nice quality—the cushions are thick, repel liquid, and the pieces all fit together snuggly when not in use. Note that the table is slatted so some rain does get through and thevpillows need to be shook dry or stood on end to drain. 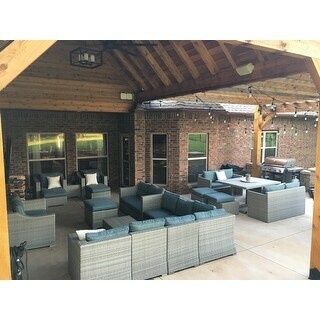 Everyone comments what a great set it is, and we can fit up to 10 people in a pinch (3 on each of the benches) which makes it very versatile for a small patio! Great dining set, recommend to anyone! I like the compact of dining set that works very well for small space. The grey and blue matches very well. The cushion is a little thin and I wish it could be thicker. The colors are modern and cooler than most options available and we have now purchased 3 sets to complete our patio. The wicker seems good quality and have zero complaints about the set so far. The cushions don’t look like they’ll last longer than a couple years but we will see. We love how the benches push in and create a cube. This is a beautiful wicker patio dining set. It is very sturdy. I love the color! I look forward to enjoying this for years to come. I love my purchase! The furniture set is very sturdy. The delivery was pretty easy (furniture was left on my patio and I did not have to be home). As seen in other reviews, the only downside is the cushions are pretty thin) but the set is still comfortable. Well built for the price. No issues thus far. High quality set. Better than I expected. It took about an hour to put everything together but instructions were easy to follow. It was a heavy package delivered so if you have a stoop or steps to your backyard, you'll need two people to lift. But it can be put together with one person. A great addition to our patio. My only complaint is the smell of the fabrics. They smell of chemicals and need sometime to air out completely before using. Love it! Very functional and versatile for seating larger groups. The set appears to be good quality, color in pix is accurate. Set up in my yard and it looks great. Love how it all combines for easy storage during the winter months. Great color and materials. Very comfortable. Perfect for us when we just want to come home and relax with a drink or pull it all together for a family dinner. Highly recommend! 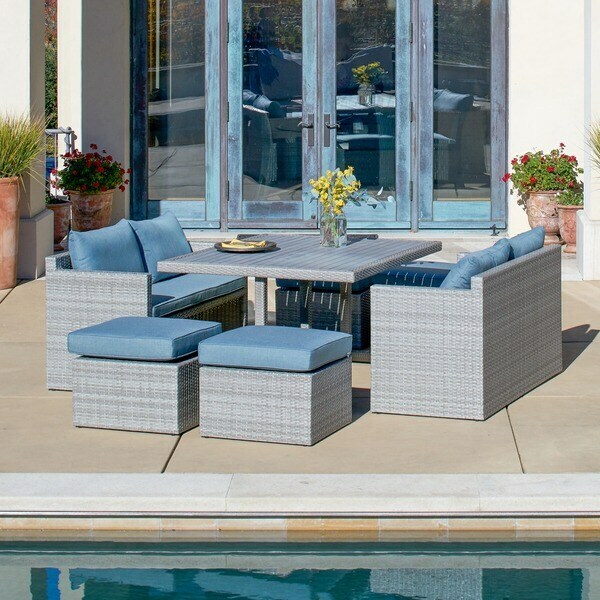 This is an amazing patio set.Came in one box and didn’t require any assembly. We have had several rainy days since we’ve received the set and the cushions dry out very fast. This set is beautiful and sturdy! "What is the shipping dimensions for this set"
"For the love seat seating, is it difficult to move it back away from the table should you need to get up from the table? " "What is the weight limit for the love seat?" The weight limit of loveseat is about 600 lbs. "Hello, I just purchased the Corvus Martinka 7-piece. I was wondering if you sell any type of cover for it (it gets too much sun exposure in the summer). if not, where can i shop for one?" Seating for 8 and compact storage when not in use. Yes, it came in 1 big box, that is the size of the table. "When all pieces are put together in a "cube", what are the dimensions? Thank you!" The "cube" measures 29.1 inches high x 57 inches wide x 52 inches deep.